11-Jan-2008 -- The story starts from 5N 116E. In order to reach this confluence, you have to find your way to a town called Kapit, which is in 7 km beeline from the point. As we were coming from the north, we considered a direct approach: taking a 4-wheel drive taxi to the town Belaga and then taking a ferry boat down the Batang Rajang River to Kapit. However, the 200km trip on bad roads from Bintulu to Belaga is 5 hours, expensive and during the rainy season very difficult. Additionally, we were told that last week a ferry between Belaga and Kapit has sunken. In order to avoid these risks, we took the “normal” route via the city of Sibu. On confluence day, we took an early morning speedboat from Sibu to the town of Kapit (130km, 3 hours). Kapit can not be reached by any road, only by riverboats. It is a nice town with a local fruit market, lots of Chinese restaurants and plenty of accommodation. While Eleonora visited the touristy sites, I took off for my favourite site: the confluence. GPS showed 7.3 km in town – so I followed my simple strategy to just start running in direction to the confluence and see what is coming up. I always try to avoid taxies nor bother with bus time tables. After leaving the town behind, I noticed that a paved road directly pointed towards the confluence. When a bus came along, I hopped in. This short bus ride let me approach the distance to the confluence point from 5km to 500m. But covering these last 500m were quite challenging. First, I followed a footpath that lead down through a rice paddy and a little hut (250m beeline). This is the location, where Keith, the first attempter of this confluence turned around when he saw a “brick wall” coming up. What he meant was the dense scrubs that had to be crossed. In addition, the terrain got extremely steep. I crossed a river and climbed the first hill that took me almost half an hour to ascend. But standing at the top (GPS showed 180m) I unhappily saw that I had to climb all the way down again. Again I struggled through the dense canopy with the terrain being so steep that I would categorize it as dangerous. However, down at the bottom, I was confronted with a huge river that could be crossed only be swimming. I considered a swim across already when I noticed a dam further down the stream. That could be a possibility to cross the river – I thought. In order to get there, I had to climb that hill one more time up- and down. The dam (picture #5) was almost broken, but indeed let me cross the river on dry feet. I don’t want to bore the reader with further details of hiking through the shrubs. More steep hills cost a lot of sweat and required endurance, but at one point – almost on the top of a hill I found myself on the confluence. Through the trees I had a view to the road and houses could be seen. The primary forest is long time gone in this area. Ferns, high grass, a variety of small trees from the vegetation dominate the vegetation. After documentation of the CP, I took the safest route by tracing the same way back. When I reached the main road, I noticed a sign (picture #6). Since I don’t speak Malay, I can’t give you a translation. I only know that something probably costs a fine of 200 RM (Malaysian Ringgit; 42 €/62 US-$). May be this information is useful for the next visitor, may be it just warns you not to litter. 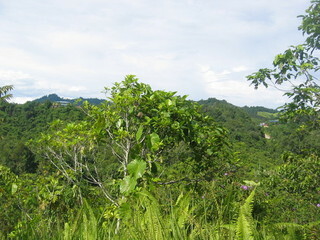 Description of the CP: Quite deep inland on Borneo Island in Sarawak Province. In a cultivated region, some rice paddies are nearby. Direct location in dense overgrows on a steep hill. Story continues at 2N 112E.